FC Pune City interim coach handed over the captain's armband to Gurtej Singh. Three changes were made by the home side - Golui, Ashique and Diaz replaced Ashutosh, Alfaro and Marko Stankovic. For Chennaiyin, Isaac Vanmalsawma found no place for himself in John Gregory's plans for today's tie. Orlandi, Thoi and Salom were demoted to the bench as Mailson, Germanpreet, Nelson and Jeje were selected ahead of them in the starting XI.
.@jejefanai and Mailson Alves return to the @ChennaiyinFC starting XI while Emiliano Alfaro will start from the bench for @FCPuneCity! FC Pune City started on the front foot and took the lead in the ninth minute of the game courtesy of Aashique Kuruniyan in what was a wonderful counter-attacking move by the Stallions. Golui passed the ball to Marcelinho who laid it down for Robin, who sent in a superb long cross for Ashique on the left side of the goal. The youngster made no mistake in handing his team with the lead. This was a major setback for Chennaiyin who desperately needed a win tonight. Pune eventually held on to their lead for the remainder of the half. Chennaiyin had to respond in the second half by hook or by crook and they did exactly what was expected out of them. Mailson Alves and Gregory Nelson scored in the 54th and 56th minute to give the away side a shock lead. The first goal came courtesy of youngster Anirudh Thapa's assist from a free-kick which Mailson Alves converted in the 54th minute. Two minutes later, Chennai went into a shock lead again with Alves, this time providing Gregory Nelson with an assist. Chennaiyin were like a sleeping giant who suddenly woke up as they took a two goal lead in the 69th minute courtesy of Inigo Calderon. Thapa put in a corner and after a bit of scuffle in the box, Raphael Augusto provided Calderon the chance to score from an overhead kick from the six yard box. Calderon obliged and Chennai were on seventh heaven with a 3-1 lead. Just three minutes after that, the Super Machans completed what was one of the best second half performances by a team this season as Thoi Singh scored in the 72nd minute. A lung-bursting run from Raphael Augusto on the right saw him dash past Fanai. He then put in a low ball across the face of goal and Jeje had a shot on goal which was saved by Kamaljit Singh saves, but the rebound fell to the sub Thoi, who slotted the ball into the back of the net. 4-1!!
. @ChennaiyinFC have turned this game on its head within a matter of 15 minutes! Pune were destroyed in under 20 minutes in the second half. 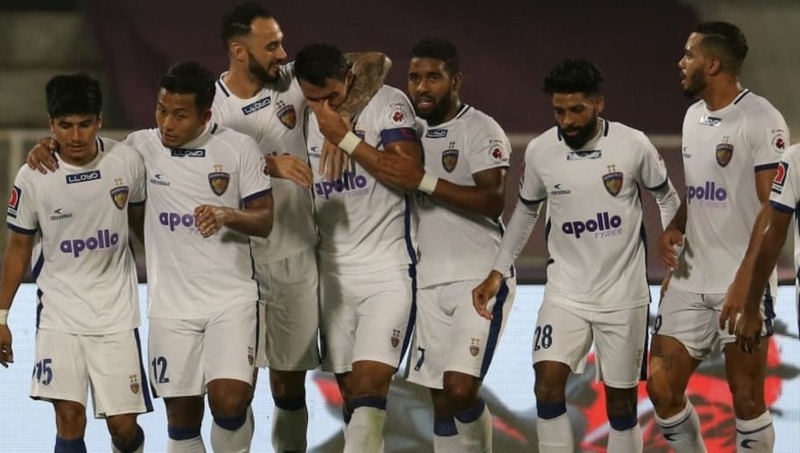 Chennaiyin scored four past them from the 54th minute to the 72nd minute. Jonathan Vila did claim a 90th minute consolation for the Paltan before their main main Marcelinho came up with a moment of utter disgrace and was shown a straight red after he lunged into Germanpreet Singh with a two footed challenge in the final moments of the game. Singh had to be taken off on a stretcher with a scare of a major injury.